I've seen a few new faces participate in the past few weeks, and have new followers too. To you - I say "WELCOME!". Please feel free to poke and prod. I encourage you to share your favorite recipes; your surprise successes and your "OMG" failures too. 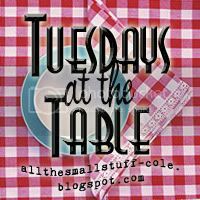 But most of all - I encourage you to visit all the fabulous and talented people who contribute recipes each week. In a small bowl, whisk the pesto mix, olive oil, chili powder and cayenne. Add peanuts and stir to coat well. Transfer to a 13x9 baking pan. Bake, uncovered at 350 for 15-20 minutes, stirring once. Cool on waxed paper and store in an airtight container. What a fun combination. I haven't heard of anything like these before, but I bet they are really tasty. This may be the perfect solution for a late holiday gift! Thanks for sharing! Sounds good. A great treat after all the sweets I've been eating! These look so good!! I am having a party this weekend and I am going to have to try them! Oh those sound yummy. I hope you have a great day.. I did not play along this week. I have a fun post up though. Those peanuts sound like one of those things I'll make and not be able to stop eating - yum! What a great idea for New Year's Eve. Happy New Year to you! I love this recipe! My dh loves spicy peanuts and I bet I can save money making them myself. Thanks for sharing this recipe! These sound really good; I will definitely have to try them. Happy New Year and I hope to see you over at Crock Pot Wednesday this week. New to your blog, I see I will be coming back over and over.